Whether finishing a digitally printed web off an inline digital printing press, using a flexographic print module, or integrating with a lot/date code printer. 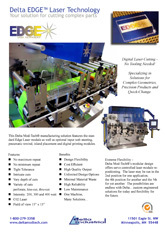 Delta has your printing and finishing equipment needs covered. Delta presses also give you flexibility to changeover the machine and run products from entirely different markets and industries quickly and easily. Digital Laser Cutting - No Tooling Needed! Specializing in Solutions for Complex Geometries, Precision Products and Quick-Change.